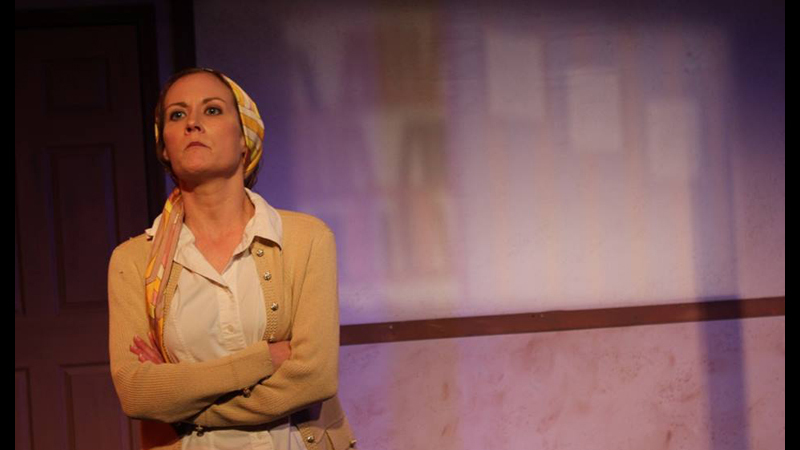 The one-woman show highlights five generations of women within one family. Thanks to an established tradition of naming the first-born daughter Katherine, we glimpse the carriers of that name (all played by Melissa Beckwith) over the course of about a century. Beginning with a farmer’s wife who addresses God one night in a barn, the play goes on to feature a single mother of five who’s desperate to find work during the Depression; a snarky, bored, alcoholic housewife who’d prefer a male therapist; an addict-turned-motivational speaker who finds God in a school community’s response to a natural disaster; and a contemporary single businesswoman who stands at a personal and professional crossroads. The 90 minute play, directed by David Wolber, is structured in five scenes, with minimal props and nifty transitions that show us Beckwith, in silhouette behind a screen, transforming into the next Katherine. Dan Walker designed the show’s gorgeous lighting, on best display in the opening scene, wherein the rich colors of moonlight mix with the warm glow from Katherine’s lantern. The spare sets are also Walker’s design, and he achieves what’s needed with a couple of small crates, a chair, and a microphone. (No costume designer is named in the program, but when a show is this minimal, the characters’ clothes are all the more important, and each outfit is well-thought out, right down to the accessories.) Carla Milarch supplies the show’s sound, highlighting numerous songs about Katherine, Kathy, Katie, etc. The premise of Katherine is intriguing, and though the show has been billed as a story of mothers and daughters, I came away thinking more about how much we’re shaped by the time in which we live. Nonetheless, Carney writes with wit and compassion, deftly providing a viable context for each monologue (no small feat), and letting her characters say things that might make you squirm in your seat. Yes, after the first few scenes, I occasionally got distracted while trying to keep things straight and re-connect dots, since Carney fills in gaps at the same time we’re jumping forward in time; and while “Katherine”’s cyclical, episodic nature feels refreshing in one sense, you may also – sheerly out of habit – find yourself yearning for a more sustained, deeper emotional dive. But in this world premiere production, Carney’s ace-in-the-hole is Beckwith, who is expertly guided by Wolber and gives a knockout, nuanced performance in each scene. Shifting accents, eras, and personalities in moments, and somehow making it look effortless, Beckwith navigates a broad expanse of emotional terrain, using her wide, expressive eyes to land a joke, or convey disdain, love, desperation, wonder, or pain. She wrings every comic opportunity from Carney’s script, and thanks to Wolber’s thoughtful blocking, Beckwith’s stage movements feel natural while preventing the play from becoming visually static. Though Mother’s Day now appears in our collective rearview, Katherine invites you to spend an evening contemplating the lives of not just the people who raised you, but the long line of those who came before them, each confronting the struggles of their circumstances and era, and each with their own rich story to tell.